Sounds like a sixties-vintage song. Maybe I am hallucinating. Already sick of restaurant food. Would much rather have food made by my significant other, even if it sometimes is only tuna helper. Hell, I'd even like it if I prepared it. Speaking of vintage, one of my classmates and I were looking at an über-cool website today featuring digital displays of the vacuum-tube variety (valves for those of you across the pond - always got a kick out of the difference). 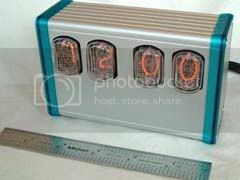 Nixie tubes weren't necessarily all the rage, they simply were all that was available. For you youngsters, this was pre-LED, LCD, plasma, and VFD. Yes, it was a BFD. There's something about the hearty glow of a vacuum tube - and whatever the tube happens to be installed in can double as a space heater. But in my day, all those vacuum tubes were made here in the United States, now they're made elsewhere. More than likely in Russia.